In 1937, Tianjin Institute of Industry and Commerce was renamed the School of Engineering which was comprised of the two departments of Civil Engineering and Architectural Engineering. Chen Yanzhong was the first Director of the Department of Architectural Engineering, and in 1943 Shen Liyuan was appointed and succeeded Chen Yanzhong. In October 1948, Tianjin Institute of Industry and Commerce had three schools and ten departments, and was renamed Private University of Jingu, of which the Engineering College consisted of the Department of Architectural Engineering, Department of Civil Engineering and Department of Mechanical Engineering. In October 1946, the Architectural Engineering Department of Tangshan Institute of Technology was founded, and the first Director was Lin Bingxian. In September 1950, Tangshan Institute of Technology was renamed Tangshan Institute of Technology of China Jiaotong University. In autumn of 1950, Tangshan Institute of Technology of China Jiaotong University. was renamed Tangshan Institute of Technology of Northern Jiaotong University. and its Department of Architectural Engineering resumed enrolling students. Professor Xu Zhong et al. of the Department of Architectural Engineering of the National Central University were employed to teach at the Department of Architectural Engineering of the Tangshan Institute of Technology of Northern Jiaotong University. The focus of the education system shifted from “engineering” to “engineering and art”. In 1952, the Chinese institutions of higher education were reorganized. The Department of Architectural Engineering and the Department of Civil Engineering of Private University of Jingu, Department of Architectural Engineering of Tangshan Institute of Technology of Northern Jiaotong University and the Department of Civil Engineering at Tianjin University were merged to form the Department of Civil and Architectural Engineering at Tianjin University. Zhang Xianglin was appointed the Director of the department, and Xu Zhong was appointed the Director of the Teaching and Research Office of Architectural Design. At the beginning of 1954 the Department of Civil and Architectural Engineering divided into the two departments of Civil Engineering and Architectural Engineering. Xu Zhong resumed as the Director of the Department of Architectural Engineering. This department had four Teaching and Research Offices including Architectural Design, Architectural Technology, Architectural History, and Fine Arts. In 1954, Lu Sheng presided over the task of surveying and mapping the Chengde Mountain Resort and Chengde Eight Outer Temples as well as the inner court of the Forbidden City. In the spring of 1958, Tianjin University Research Institute of Architectural Design was established. Xu Zhong was appointed as the Dean.. In the autumn of 1958, on behalf of the Department of Architecture at Tianjin University, Professor Xu Zhong went to Beijing as part of the team to design of the Great Hall of the People. In 1960, the first batch of postgraduate students were enrolled in the Architecture program. In 1966, student enrollment in the Architecture program was put on hold. In 1977, the enrollment of undergraduate students in the Architecture program was resumed through a college entrance examination. In 1978, the enrollment of postgraduate students in the Architecture program resumed. In 1980, representatives of Kobe University of Japan visited Tianjin University. and the Associate Professor of Kobe University of Japan, Toshiki paid a visit to the Department of Architecture. Both universities reached an agreement of international academic exchanges. In the summer of 1981, over 30 teachers and students from University of Minnesota visited the Department of Architectural Engineering of Tianjin University to learn about the Chinese style of architecture. It was also the, start of international student exchanges. In July of 1982, the book Ancient Buildings in Chengde was published, and won the first prize of the National Outstanding Scientific Book Award. It was translated into Japanese and published in Japan by Asahi Shinbun Press. In 1986, the urban planning was established and approved by the Sate Education Commission, It began enrolling undergraduate students in 1988. 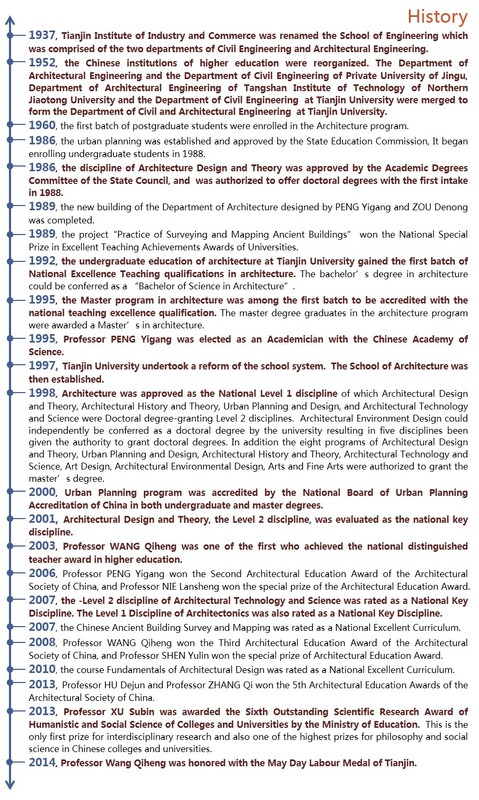 In 1986, the discipline of Architecture Design and Theory was approved by the Academic Degrees Committee of the State Council, and was authorized to offer doctoral degrees with the first intake in 1988. In 1987, a project supported by the National Natural Science Foundation of China was approved for the first time. In 1987, enrollment of international undergraduate students began. In 1989, the new building of the Department of Architecture was completed. In 1989, the project，“Practice of Surveying and Mapping China’s Ancient Buildings” won the National Special Prize in Excellent Teaching Achievements Awards of Universities and Colleges. In 1992, Yu Zhaozhong, a friend of Professor Xu Zhong, proposed to found “Xu Zhong Scholarship” to award university students who worked hard to achieve excellent grades in their academic studies. The first “Xu Zhong Scholarship” was awarded in 1995 and has been the most senior professional awards of any Department of Architecture. In 1992, after been evaluated by the National Board of Architecture Accreditation of China the undergraduate education of architecture at Tianjin University gained the first batch of National Excellence Teaching qualifications in architecture. Approved by the Academic Degrees Committee of the State Council, the bachelor’s degree in architecture could be conferred as a “Bachelor of Science in Architecture”. In 1994，the Tianjin University Research Institute of Urban Planning was established and Xiao Dunyu was appointed as the Dean. In 1995, after the accreditation by the National Board of Architecture Accreditation of China, the Master program in architecture was among the first batch to be accredited with the national teaching excellence qualification. Officially approved by the Academic Degrees Committee of the State Council, the master degree graduates in the architecture program were awarded a Master’s in architecture. In 1995, the Department of Architecture was selected in the “211” project of Tianjin University. In 1995, Professor Peng Yigang was elected as an Academician with the Chinese Academy of Science. In June, 1997, Tianjin University undertook a reform of the school system. The School of Architecture was then established based on the former Department of Architecture and the Wang Xuezhong Art Research Institute. Zhang Qi was appointed as the Dean. In 1998, The Doctoral Level 1 discipline in Architecture, and Doctoral Level 2 discipline in Architectural History and Theory were approved as Doctoral degree-gratning Level 1 Discipline. In 1998, Architecture was approved as the National Level 1 discipline of which Architectural Design and Theory, Architectural History and Theory, Urban Planning and Design, and Architectural Technology and Science were Doctoral degree-granting Level 2 disciplines. Architectural Environment Design could independently be conferred as a doctoral degree by the university resulting in five disciplines been given the authority to grant doctoral degrees. In addition the eight programs of Architectural Design and Theory, Urban Planning and Design, Architectural History and Theory, Architectural Technology and Science, Art Design, Architectural Environmental Design, Arts and Fine Arts were authorized to grant the master’s degree. In 1999, the Ministry of Human Resources and Social Security established the post-doctoral research in the Level 1 discipline of Architecture. In 2000, the first post doctoral scholar was admitted. In 1999, the Department of Art and Design was established and the first batch of undergraduate students were enrolled. In 2000, to carry out the “21st Century Education Revitalizing Action Plan”, the Ministry of Education and Tianjin Municipality signed an agreement to build Tianjin University as a world famous university in the 21st Century. The School of Architecture was a key unit supported under this project. In 2000, the Urban and Rural Planning program was accredited by the National Board of Urban Planning Accreditation of China in both undergraduate and master degrees. In 2001, Architectural Design and Theory, the Level 2 discipline, was evaluated as the national key discipline. In September 2003, Professor Wang Qiheng was one of the first who achieved the national distinguished teacher award in higher education. In 2004, Urban Planning was accredited with excellence by the National Board of Urban Planning Accreditation of China. In 2006, Professor Peng Yigang won the Second Architectural Education Award of the Architectural Society of China, and Professor Nie Lansheng won the special prize of the Architectural Education Award. In 2007, the -Level 2 discipline of Architectural Technology and Science was rated as a National Key Discipline. The Level 1 Discipline of Architectonics was also rated as a National Key Discipline. In 2007, the School, for the first time, was approved of a key project of the National Natural Science Foundation of China. In 2007, the Chinese Ancient Building Survey and Mapping was rated as a National Excellent Curriculum. In March, 2008, Research of Surveying and Mapping on Historical Buildings was approved as aKey Scientific Research Base of State Administration of Cultural Heritage. In June, 2008, Professor Wang Qiheng won the Third Architectural Education Award of the Architectural Society of China, and Professor Shen Yulin won the special prize of Architectural Education Award. In 2010, the course Fundamentals of Architectural Design was rated as a National Excellent Curriculum. In 2010, the International Research Centre for the Chinese Cultural Heritage Conservation was approved as the Key research base of Humanities and Social Sciences of Tianjin general institutes of higher education by the Tianjin Municipal Education Commission. In 2011, the Japanese Monograph Relationship between Chinese Cities and Architectures and Japan--- the Modern History of Subject Capability, by Professor Xu Subin, won both awards of the Architectural Institute of Japan and awards of the Architectural History Institute of Japan. In 2012, in the China Discipline Assessment by the Ministry of Education, the School of Architecture rated the third in the national assessment of Level 1 discipline of Architectture, and obtained the sixth position in the national assessment of - Level 1 Discipline of Urban Planning. In September, 2012, the School passed the assessment of Newly-Established Disciplinary Innovative Intelligence Introducing Base of Institutions of Higher Education in the year 2013 by the Ministry of Education, which will effectively promote the international communication and collaboration. In December, 2012, the School, for the first time, was given the approval to undertake major projects and key projects of the National Natural Science Foundation of China. In April 2013, Professor Xu Subin was awarded the Sixth Outstanding Scientific Research Award of Humanistic and Social Science of Colleges and Universities by the Ministry of Education. This is the only first prize for interdisciplinary research and also one of the highest prizes for philosophy and social science in Chinese colleges and universities. In June and July 2013, the Reconstruction and Expansion Project of Hebei Library, directed and designed by Professor Xin Zhang, was given the Gold Prize of the Architecture Design Award by the Architectural Society of China, and first prize of the National Excellent Exploration and Design Award. Professor Zhang also directed the Renovation and Reconstruction Project of Tianjin’s Astor Hotel which won the Silver Prize of China Construction and Design from the Architectural Society of China. In July 2013, the architecture designed by Professor Zeng Jian was awarded the Gold Prize for Outstanding Residential District of 2013 China Tien-yow Jeme Civil Engineering Prize (Tien-yow Jeme Prize) is a civil engineering scientific award approved by the Ministry of Science and Technology and affirmed by the Ministry of Construction. In March 2014, Professor Wang Qiheng was honored with the May Day Labour Medal of Tianjin.